If it’s Features You Want in a Faucet, This Model is For You! I’m a pretty sociable person (which helps considering my work involves talking to people all day), and I have what I like to think is a large circle of friends. One in particular is gadget mad, and she recently came to me for some advice because she wanted to change the faucet in her kitchen. When I asked why she told me her current faucet just didn’t offer enough in the way of features, and well, it had sprung a leak that just refused to be fixed. 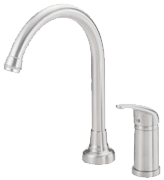 So, knowing that my friend liked to have appliances that include as many “bells and whistles” as possible, and she also likes the finer things in life, the Kohler K-560-VS Bellera model was the first faucet I thought of. After telling her all about this model she bought one and is really pleased with the result, which is why I decided to add this review to my website. Below, you’ll find all the information you need to help you make your mind up on whether this faucet is the model you’ve always wanted. I know from experience that when someone is looking for a new “tool” in their kitchen, looks are important. After all, the finishing touches are what matters and Kohler do not disappoint in this department. They have managed to combine modern with classic, and on first glance you will see how much thought has gone into the overall design. This faucet has curves in all the right places, and the single lever is attractive without being awkward. In fact, the ergonomic design is really easy to use even if you have soapy hands. It’s available in several colors including oil rubbed bronze, polished chrome and vibrant stainless so you shouldn’t have too much trouble with it fitting into the current theme in your kitchen. Features! I happen to be a little jealous of my friend because I think she has chosen the one pull down kitchen faucet on the market that ticks pretty much all the boxes. Some of you might think that a faucet is just there so you can get hot or cold water “on tap”, but Kohler has proved there is a lot more to be had from this appliance in your kitchen. First of all you have the benefit of a one or three hole installation and yes, they have included the escutcheon plate if you need it! Although most people find this faucet easy enough to install on their own, if you’re anything like my friend when it comes to plumbing you might want to call in the experts. The high arc design allows you to easily fill the largest of pots or pans, and it has the capability of rotating 360 degrees for further ease of use. The next feature I’m going to tell you about happens to be one of my favorites. You don’t just get a steady stream of water from the head, you can choose from an aerated flow, spray and you even have a pause function. However, when using the pause function you do need to keep the button depressed or it will switch back to your chosen flow. The pull down hose is made from heavy duty nylon and uses a ball joint configuration which means you can rinse your sink with ease. It has a reach of about 26 inches which means you can fill your pots and pans from the countertop if they’re too big for your sink. The manufacturer has also included a MasterClean spray face that’s resistant to mineral build-ups, making it very simple to keep clean. 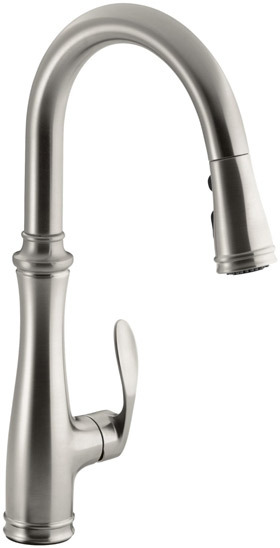 Overall, I was more than happy to recommend this kitchen faucet to my friend and she’s glad I did as well. If you think this faucet might be the answer to what you’re looking for, why not take a look at Amazon? The last time I looked this model up there were some great deals to be had on the list price which makes it an even more attractive choice.